Larry and Denise presented at the Eighth ICCS Conference on June 28th in Boston, MA. Their subject was “Navigating the Complexity Space.” The presentation was well-received, stimulating a number of follow-up conversations with other participants. 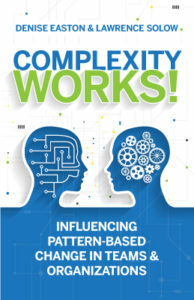 Click APICS presentation: “Navigating the Complexity Space” for a copy of that presentation. Larry and Denise presented at the New Jersey OD Network Annual Sharing Day.